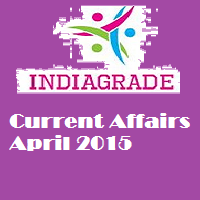 Current Affairs 8th April 2015: Today we are going to provide the important updates on April 8th, 2015. Our INDIAGRADE website frequently update the daily current affairs for government jobs, bank jobs, railway jobs, defence jobs preparation. Every day so many number of candidates are following our site to know the important things. You can easily download the April month current affairs 2015 directly from our portal as PDF format. If you prepare for any competitive exams then you must study in daily basis. Now a days the competition for bank exams are very high. So hard working people only get the jobs. Just study our APTITUDE QUESTION, most of the question will asked from this section only. Small plane crashes returning from the NCAA basketball tournament in Indianapolis and all seven people dies. The United States approves USD 952 million worth of missiles, helicopters and other defence equipment to Pakistan to help country from terrorism. 10 Syrian soldiers killed in car bomb blast. Prime Minister Narendra Modi is launched MUDRA Bank, which help small businesses & former. The Mudra Bank corpus of Rs.20,000 crore to extend credit of up to Rs 10 lakh for small business. Amitabh Bachchan receives Padma Vibhushan from President Pranab Mukherjee. Prince Karim Aga Khan, filmmaker Jahnu Barua, computer scientist Vijay Bhatkar also get Padma Vibhushan from President. In Lucknow 1,500 digital ration cards will be distributed today. IPL 2015: Today Mumbai Indians(MI) VS Kolkata Knight Riders(KKR) play the inauguration match at Eden Gardens. Sri Lankan players not allowed to play IPL games in Chennai.